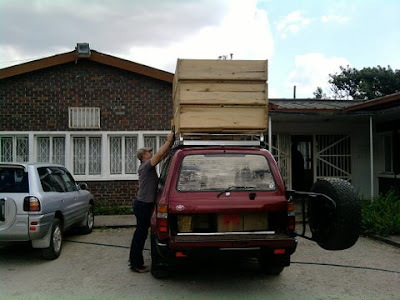 Alive In Africa: Moving Day! We moved our offices last week. It was a pretty crazy move and thankfully God provided at the last moment. I’ll try to get some pictures of our new place later, but until then, I thought I would include a blog from our teammate Brent Roberts to give you not only the why but also the challenges behind it! That being said, let me update you on the most recent happening with ACTION Zambia the office move. I know what you're thinking: sounds boring. Well, I can't promise you it won't be, but I'll try to make it somewhat worth reading. About a month ago, we found out that our Landlord for our current office space was raising the rent by 35%, an amount we could not afford. I won't get into the details, but let's just say we weren't happy. Real estate here is in very high demand. So, for the past few months, our director has been beating down doors trying to find suitable space for us to move to. Well, at the 11th hour, the Lord provided. Literally, the day we were moving out of the office space we were in, God provided another space and we were able to move our stuff straight in. Anyways, the day we moved, we had everything out except for the office safe. It turned out that when we originally moved in to the previous space, we brought the safe through a door that was no longer available for use. And to our surprise, the safe was too big to fit through the front door. We tried everything we could to get it out, short of destroying the doorway, but we just couldn't make it work. So, we were left with two options: leave the safe in the previous office space or alter the safe so we could get it through the door. We chose option two. One of our pastors is a metal fabricator. So, we contracted him and his business partner to cut the safe in half, move it to the new office space, and then weld it back together after moving it in. All that to say, it worked like a charm. But I can't promise that if we have to move again that it will go with us!